People For Jesus International Ministries (PFJIM) continues in the work of ministry and expanding its work in Kenya and beyond. People For Jesus International Ministries(PFJIM) continues in the work of ministry and expanding its work in Kenya and beyond. The task of Gospel proclamation is vast and it takes the power of the Holy Spirit and the power of the Gospel to realize the vision for reaching the world with the gospel message. The Book of Romans 15: 17-20 is the apostolic pattern that we emulate as we proclaim the Gospel. Pastor Tom conducted a powerful training for Church pastors, elders, Children ministry leaders, and other Christian workers during that time. Kitale is located about 350 kilometers away from Narok town and is on the North Western part of Kenya. It was a life-changing experience for the leaders of Life-Line Ministries Fellowship of Kenya in Kitale region who had invited pastor Tom to train their leaders. We had 45 Church leaders in attendance. We had Church AGM in the western Kenya town of Siaya near the native home of the current president of America Mr. Obama. It was a time for different Church leaders to come together for prayers, discussions on the future of ministry in Kenya and beyond, share vision/challenges/victories and plan the work of ministry together as saints. Many Christian leaders attended the meeting. Pastor Tom and pastor John Ole Tarkash both from Narok attended the meeting. Siaya is about 350 Kilometers away from Narok. Pastor Tom conducted a two days training for the PFJIM leaders and members on Missions and Evangelism. He challenged the leaders/Church members to be always engaged in witnessing as it is the basic responsibility of every Christian believer. On 2nd and 3rd December, pastor Tom lead the Narok town Church members to do door-to-door and house-to-house evangelism in some residential areas of Narok town. Several people gave their lives to Christ. 8TH – 10TH DECEMBER 2011: OLOOLTOTO MAASAI VILLAGE CHURCH MISSION. PFJIM had a busy time witnessing in home-to-home evangelism, conducting training seminar, and conducting open air crusades for three days at the PFJIM Maasai village Church of Olooltoto. Many Maasai people became believers in Christ and lives were changed for Christ. The elders, women, the youth and the PFJIM Missions Council Team, did a lot of work to ensure that the remote Maasai village receives the Gospel in a powerful way. Pastor Tom was invited to Kisumu, which is about 280 kilometers away from Narok town, by the Life-Line Ministries Fellowship of Kenya to conduct a Church leaders training conference for their leaders in Nyanza region. More than 40 leaders attended the conference and it was such a life-transforming training. He dealt with subjects such as Ministry and Marriage, leadership dynamics in Church, etc. On 17th December 2011, we had our annual Church members/leaders celebration. At that event, we normally award those members and leaders who have performed with excellence. We also enjoy meals together as a Church family of believers as we thank God for what He has done through us the whole year. We also share our plans for the following year with the Church members and friends. That day is also a time for different departments to share what they do with the whole Church. Many people attended the celebration. Our Big Meal 2011 was such a wonderful one. It was the biggest we have ever had since we began to have the event three years ago. We had it in Pakistan, Tanzania Church and in two Kenyan Churches of PFJIM. This is also our annual event in which poor children, orphans and poor families get a chance to eat like royalties in the Church. We treat the poor children with very delicious meals as they listen to the gospel. Poor fathers and mothers also come along and join the children. Children are awarded presents/prizes for different reasons. In Tanzania Church, we had about 100 children. 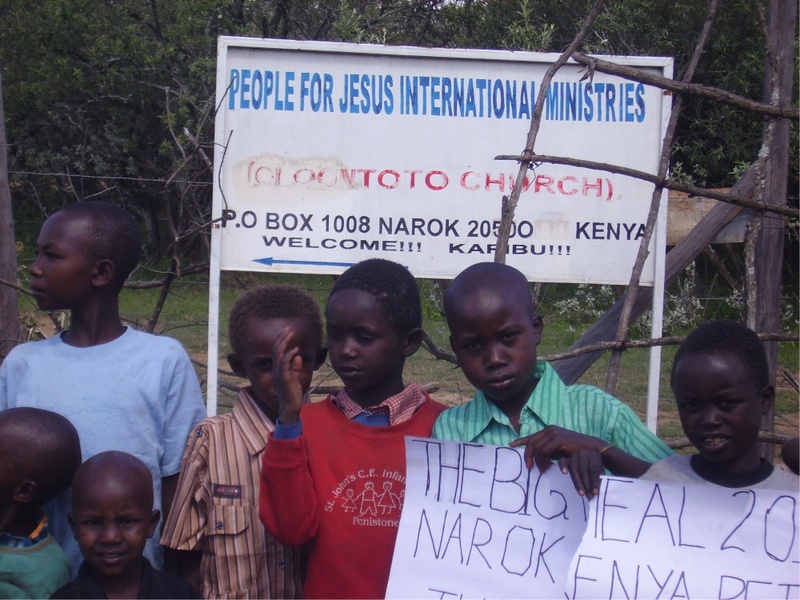 In Narok town Church we had about 250 children. In Narok Maasai village Church we had about 100 children. We thank you for your prayers, contributions and any other way you made the Big Meal 2011 a success. 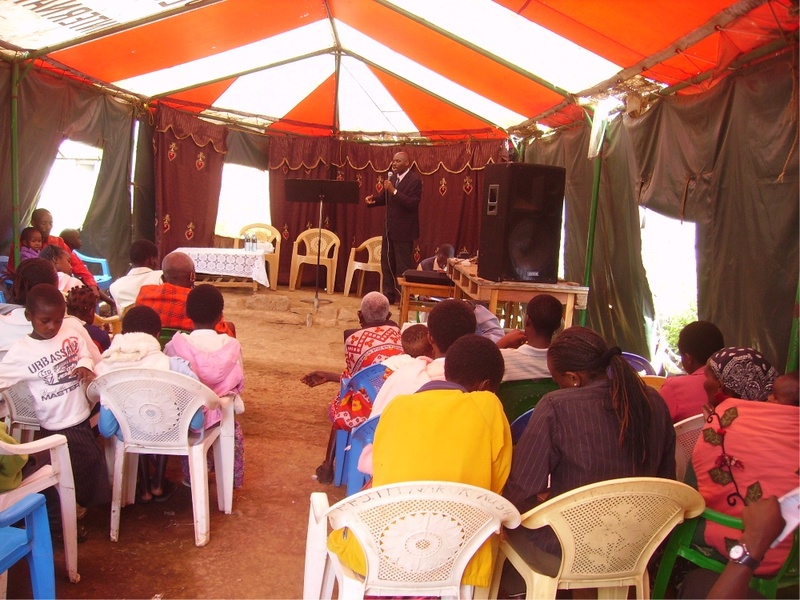 On 31st December 2011, we had a seminar in which spiritual principles of evaluation/self-examination were taught by pastor Tom during the day. The night of 31st December 2011 till the morning of 1st January 2012 was a time of prayers and humility before God as we ushered in the new year 2012 in the Church. Several people became born again believers at the overnight prayer meeting on the night of 31st December 2011. On 1st January 2012 Sunday Worship service at the Narok town Church, one man became a believer due to the previous overnight prayer meeting impact on him. Tanzania PFJIM Church has grown tremendously at the Morogoro head Church. There are now more than 40 adult members and many children. There are also church fellowships in the towns of Dodoma and Dar-Es-Saalam. Plans are under way to have a Church at Morogoro town. At this time, we are still processing the government registration of Tanzania Church. Pastor Samuel and his wife Reginah are doing a great work there. Water baptism was done there on Christmas day. Poultry project and orphanage programs are moving on well in the Tanzania Church. PAKISTAN Church is also moving on. Information is slow since one Bishop who used to be good in quick communication went to be with the Lord in August 2011. Pastor Tom plans to travel there in 2012 to strengthen the Church. PRAYER NEEDS: 1. Monthly support for orphans/vulnerable children and student sponsorship for needy students in High school, colleges, and universities. Mission trips to India, Pakistan, Uganda, Tanzania, and South Sudan, etc. for Church expansion. THANK YOU VERY MUCH FOR YOUR CONTINUED PARTNERSHIP IN THE GOSPEL WITH US. At AfricanChristian.info we’d love to hear the story of how your church is working to proclaim and gospel and end poverty in your community – Make a comment below or email us your thoughts. Greeting in Christ. We thank God for the valuable work that you continue to do together with us for the sake of the expansion of the Kingdom of God. Your prayers, support and personal participation have ,always been instrumental in enabling us to accomplish the various dynamic tasks of the mission work we do. We are truly thankful for your relentless and tireless efforts in your partnership with us for the spread of the Gospel — Philippians 1: 5. Please join us in the year 2012 in praying for the following needs and plans as summarized below. You can always inquire details about any item. a) Cross-cultural international Church planting mission to Pakistan\ for one month: US$4,700 (UK Pounds 3,000). Costs include airfare, accommodation, ministry activities, plus other logistics. Details to be communicated later. b) Cross- Cultural international follow-up mission in our Church in Tanzania for two weeks: US$2,000 (UK Pounds 1,500). To cater PFJIM team members from Kenya – about 4 people. Also pray for proposed church building there for 200 people. Land already available. d) Cross-cultural international missions training in Uganda for 3 Church Mission Team leaders in January 25th 2012 for one week: US$450 (UK Pounds 280). That is total costs for all expenses. g) Foreign mission teams from UK, USA and other parts of the world to come and do ministry with us. h) Local Outreach evangelistic activities/seminars in Narok Maasai areas in April, August and December 2012: US$1,350 (UK Pounds 850). To take care of one full year. j) Relief items for the poor in church working communities e.g. clothes, food, books, pens, toothpaste, toothbrushes, shoes, etc..
People For Jesus International Ministries — Kenya, East Africa. needed to build an international standard guest house and camping resort. Kenya programme to get volunteers,interns,missionaries and visitors from overseas. 3)That God will bless us to always have at least five(5) visitors from overseas at any particular time. 4)That God will supply me with the finances to buy a small bus to carry my visitors. 5)That the LORD will give me the ability to transform Education Supplements International into one of the major volunteer placement organizations in Kenya. 6)That our tours and travel business will prosper profitably.